A day never goes by when I don’t feel incredibly blessed to be working on the periphery of the wine industry, marketing and selling Napa Valley vineyards and wineries. How lucky am I! Over the past 13 years, I have met people from all walks of life with fascinating backgrounds, who have decided they want to get in the wine business or own a gentleman’s vineyard and make their own wine. A good percentage of them have been from Asia, and across the board they are highly educated (usually in the United States at Ivy league colleges), are very successful, loyal, respectful, they know what they don’t know and listen and trust my guidance, and they all have a great sense of humor. They are a dream to work with and many have become close friends of mine. From 2010 to about 2012, I saw a huge influx of buyers from China. None of them spoke English, they all came with an entourage and an English speaking real estate broker from areas with zero experience in vineyard and winery acquisitions. Well, they didn’t hang around for long. After spending the best part of a day with me, having a grand time taking pictures of themselves in the vineyards and learning that the cap rates they had in mind were not a match for apartment buildings in the middle of the country, they drove off into the sunset, never to be seen again. I remember one lunch I hosted at the request of an Asian client, when they laughed after I poured wine into their glasses and put the bottle in the middle of the table. When I asked why they were laughing, it was relayed to me that in China they each have their own bottle of Chateau Lafite at the table and they mix it with Coca Cola! Well those days and those potential buyers are behind me. Today, the Asian buyers I work with remind me of those I met early in my career, and for that I am happy! Did you see last week’s Financial Times front page story China’s Grape Rush? I had fun helping Hannah Kuchler with her research and I thought her story line “Chinese buyers thirst for profits and prestige are developing a taste for wineries in California’s Napa Valley” was a good one. Hannah explained how Chinese buyers are drawn to Napa for more than profits. Chinese vineyard and/or winery owners benefit from the prestige of owning premium property in Napa by throwing parties for business associates. But more than that, they have the potential to gain US residency thanks to the EB-5 immigrant investor program that offers a visa in return for creating or preserving jobs in the US. While I was quoted as saying: There is still a “great fascination with Bordeaux” for Chinese vineyard buyers, but the prices are becoming ridiculous. “You can pay up to $1m per planted acre over there, which can really, really zing”, I should add that we are heading in the same direction. As my illustrious list of Asian investors grows and my experience and knowledge of the complexities of acquiring Napa Valley vineyards and wineries expands, I continue to stay involved with the Asian Real Estate Association of America (ARREA) and network with its members to benefit my clients. In case you didn’t see it, a National Association of Realtors 2014 Profile of International Home Buying Activity, showed that buyers from China spent an estimated $22 billion on U.S. properties last year. That’s approximately a quarter of total international sales, 76% of which were reported as all-cash sales. Fortunately for me, more and more Asian investors are finding me and I am thoroughly enjoying being their go to person. 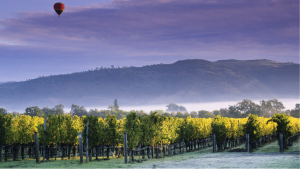 Whether you are a buyer from China or other parts of Asia, or from right here in the United States, to learn about private estate, winery or vineyards in Napa Valley or Sonoma , contact me at 707-738-4820 or email [email protected]. As a top producing Realtor® in California’s Napa-Sonoma Wine Country, I have access to some extraordinary Napa Valley vineyards, wineries, estates and homes in Napa, Yountville, Saint Helena and Calistoga that are not on the open market, as well as a deep knowledge of some exceptional overlooked on-market offerings. The off market inventory is extraordinary right now and each and every property has spectacular views. Looking forward to sharing my insider knowledge with you!